A cultivar of Prunus avium L. Above medium size, heart-shaped, broad at the stalk, and terminating at the apex in an acute, swollen point. Skin entirely covered with bright red. Stalk two inches long, slender. Flesh yellowish white, half-tender, juicy, and sweet. Beginning and middle of July. [Hogg – Fruit Manual p.55/1860 as ‘Gascoigne’s Heart’]. An old variety but I have no information on its history. Figured in George Brookshaw’s Pomona Brittanica [PB pl.IX/1812]. Brookshaw also figures a variety called ‘Red Heart’, somewhat rounder in shape [PB pl.VIII/1812]. A midseason variety of little commercial value by 1937 [Bowman]. 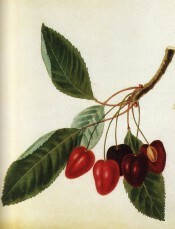 Listed in all published catalogues [Cherry no.2/1843].